Truly, the history of the Hawkmen is a convoluted one. Each Hawkman is associated with the Hawkgod, a powerful force that bestows powers on those it associates itself with. Since its servants merge with it upon their death, the Hawkmen all maintain memories of previous lives. 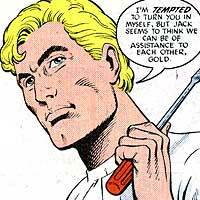 Descended from Khufu, a prince of Egypt, the original Hawkman I, Carter Hall, was an early member of both the JUSTICE SOCIETY OF AMERICA and the JUSTICE LEAGUE. Years later, Fel Andar impersonated Hall's son and briefly joined the Justice League International as Hawkman II alongside his wife, Hawkwoman I Sharon Hall. 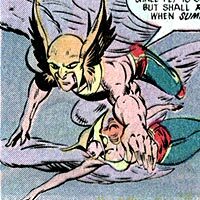 Katar Hol and Shayera Thal, members of the alien Thanagarian military known as the Wingmen, took up the mantles of Hawkman III and Hawkwoman II. After merging with the Hawkgod to form the Hawk Avatar (also known as Hawkman IV), Katar's personality was sublimated to that of Carter Hall, who has returned to the role of the Hawkman alongside the latest Hawkgirl (Hawkgirl II), herself a descendant of Kufu's wife, Cha-Ara. As a member of the Justice League, Booster Gold has worked alongside every incarnation of the Hawkman since first encountering Fel Andar and Sharon Hall as HEROES OF THE MILLENNIUM. 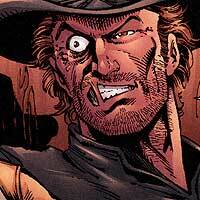 Jonah Hex was raised by Indians and fought for the South in the American War Between the States (aka the Civil War) before journeying to the American West and making a name for himself as a bounty hunter and mercenary. Later in his life, Hex was abducted into the 21st century before he returned to the old west. Despite using the same Borstein Time Platform that took Jonah Hex to the future to engineer his second trip into the past, Booster Gold didn't actually meet Jonah Hex until he traveled into the past to save the ancestors of SUPERMAN from the time-traveling villain SUPERNOVA III. Booster and Hex would cross paths a second time when Booster found himself unexpectedly replacing Red River Junction's Sheriff Moss in order to bring the sheriff's murderers (Emmit Stone, Pete Stone, and Avery Jones) to justice. Together, the pair hunted the Clem Hootkins gang (Clem Hootkins and Cyclops) and confronted Romeo and Damita. After accidentally transporting Hex to the 21st century, Booster found Hex ans returned him and his 21st-century girlfriend, Gina Green, to the Old West. Rip Hunter, the "Time Master," is the foremost authority in the DC Universe on time travel. Without Hunter's Time Sphere technology, Booster Gold would never have arrived in the 20th century, much less survived past his first year as a hero. Hunter's history is intentionally shrouded in mystery, and Ripley Hunter may not even be his real name. As an inventor, time-traveler, and discoverer of Hyper-time, Hunter has been forced to take steps to change and potentially erase his own past in order to prevent his many enemies from using his inventions to change time for the worse. Booster Gold is unaware that Hunter is, in fact, his own son. From Booster Gold's chronological point of view, Rip Hunter and Booster Gold first met while Booster was searching for a way to return to the 25th century for solutions to both technical and medical problems. Booster's knowledge of future technology, including functional future versions of Rip Hunter's Time Sphere such as the one that Booster stole from the SPACE MUSEUM for his trip to the 20th century, encouraged Hunter to test his first prototype of the Time Sphere, and the two participated in their first time-travel together. Since their first adventure together, Rip Hunter and Booster Gold have had a rocky relationship, largely because of Hunter's distrust of super heroes and Booster Gold's selfish personality. Rip Hunter has spent his time surrounded by non-powered professionals who share his interest in science and time travel, such as Jeff Smith and Bonnie Baxter. As a result of his persistence in exploring the nature of time, Hunter was indoctrinated into the Linear Men (see LINEAR MAN), where his time travel technology and knowledge was shared and enhanced. Hunter and Booster remain allies and frequent partners. For a time the two were business partners in the theme restaurant PLANET KRYPTON, which served as a base for Hunter's experiments. Booster has also joined Hunter as the two travel through the time stream, handling irregularities in the fragile time streams of the nascent 52 alternate Earths forming in the wake of Infinite Crisis. In the present day, Booster Gold remains unaware that Booster is actually Hunter's father, though Hunter knows that he is mentoring his own immature father. The identity of Rip Hunter's mother, the future Mrs. Gold, has yet to be revealed.